Oceans cover 71% of the surface of Earth and 99% of the livable space (Figure 1). The Coastal Pelagic Survey is taking several approaches to map the distribution of anchovy, sardine, and other target species within the epipelagic zone. This zone is the thin surface layer extending to the depths light penetrates the ocean, which is approximately 200 meters near California. The epipelagic zone in some coastal areas is very productive due to the upwelling of nutrient rich water causing an abundance of primary production by phytoplankton. 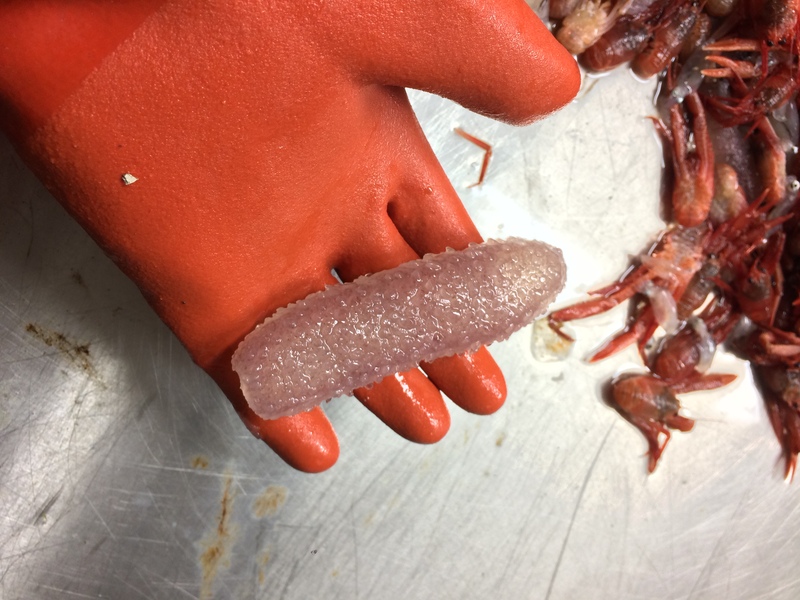 Besides the net trawling and acoustic transects, the researchers are using samples of fish eggs and ichthyoplankton (ichthyo = fish, plankton = drifting) to determine locations of spawning. 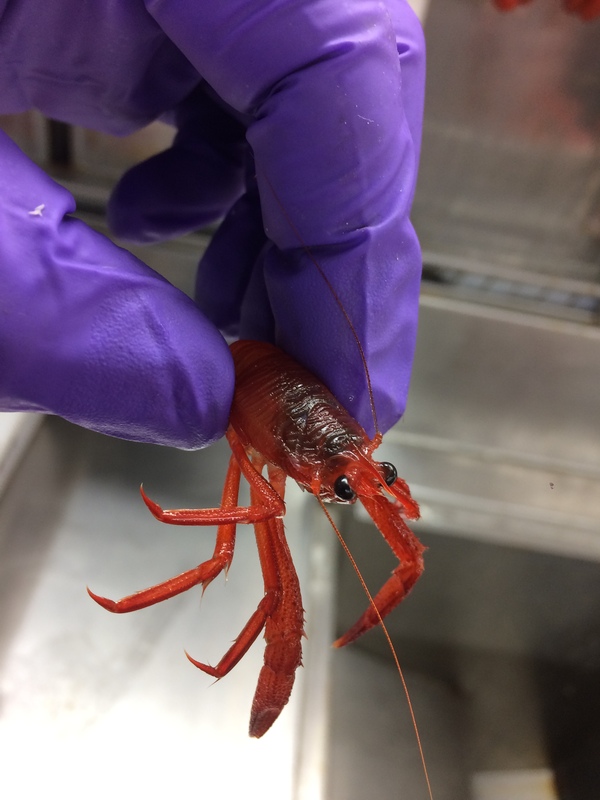 This voyage is mostly surveying over the continental shelf and I am amazed at the diversity of organisms we have found thus far. In this modern era of exploration of the vastly unknown deeper regions, I can only imagine the species still to be discovered! 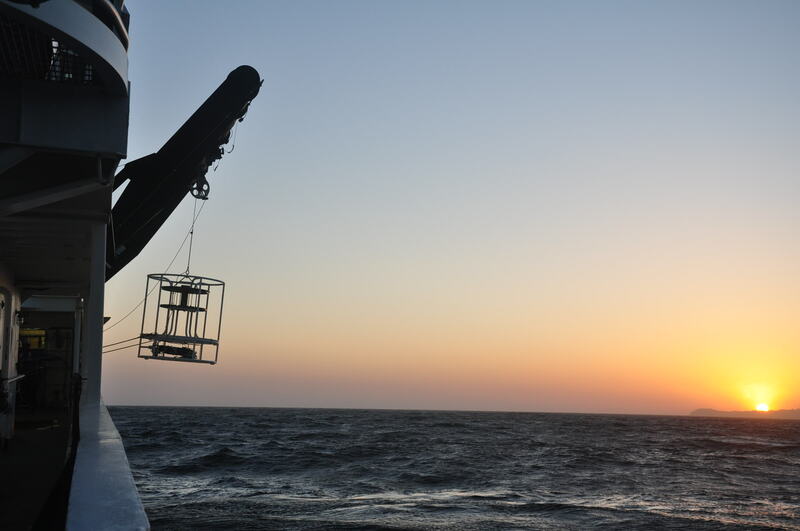 A CUFES (Continuous Underway Fish Egg Sampler) system is used to determine the location of fish eggs as we travel transects on a continuous daily basis (Figure 2). Water from 3 meters below the surface is pulled into the boat at 640 L/min. and poured through a filter to collect fish eggs and other plankton. The collected samples are analyzed every 30 minutes to determine a density of eggs and which species are spawning. The collected samples are further analyzed at NOAA’s SWFSC (Southwest Fisheries Science Center) in La Jolla, CA. Preliminary results of the CUFES survey. The CUFES data is overlaid on sea surface temperatures measured by satellite. The CUFES data is overlaid on sea surface temperatures measured by satellite. A PairoVET (paired vertical egg tow) sample is collected using a pair of small, fine mesh nets dropped to 70 meters deep and vertically towed to the surface to collect fish eggs and zooplankton in the water column at predetermined locations along our transects every 20 nautical miles. This is generally the depths that sardine release their eggs. The Bongo net gets its name because the nets are the size of bongo drums (Figure 4 & 5). This is a plankton tow that is pulled alongside the ship and occurs every 40 nautical miles. 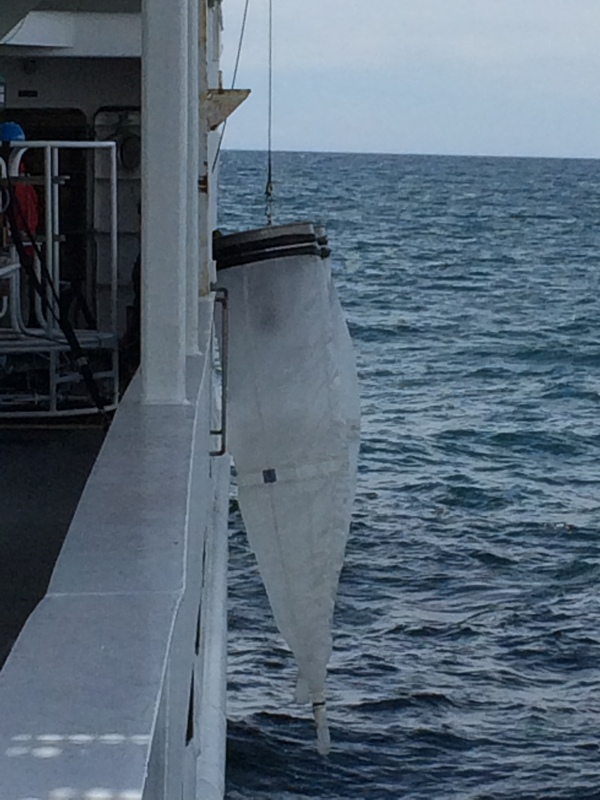 The net is dropped to a depth of 210 meters and pulled up at a 45 degree angle to get a more complete sample of the ichthyoplankton and zooplankton throughout the water column at location. Figure 4: Bongo net in center of image and PairoVET on the right. Bongo net in center of image and PairoVET on the right. Figure 5: Bongo going overboard. Figure 6: Preserving the Bongo Sample for later analysis. The scientists use a CTD (conductivity-temperature-depth) probe to measure the physical properties of the seawater throughout the water column that biologic samples are being taken (Figure 7). Conductivity is used to calculate the salinity of the water. These physical properties are very important in determining the types of organisms that are present at varying locations. One of the great mysteries of waking up is answering the question of “where am I?” After a long evening of trawling for fish and keeping an eye on where you are, you go to bed. Exhausted, the boat rocks you to sleep. When I wake up the first thing I do is, jump out of bed and run out onto the front deck. Some days, there is ocean for as far as the eye can see, some days a mysterious island (Figure 8) in the distance and sometimes there is the mainland (Figure 9)! I run to grab my phone when mainland is in sight to get a couple of phone calls out to family. 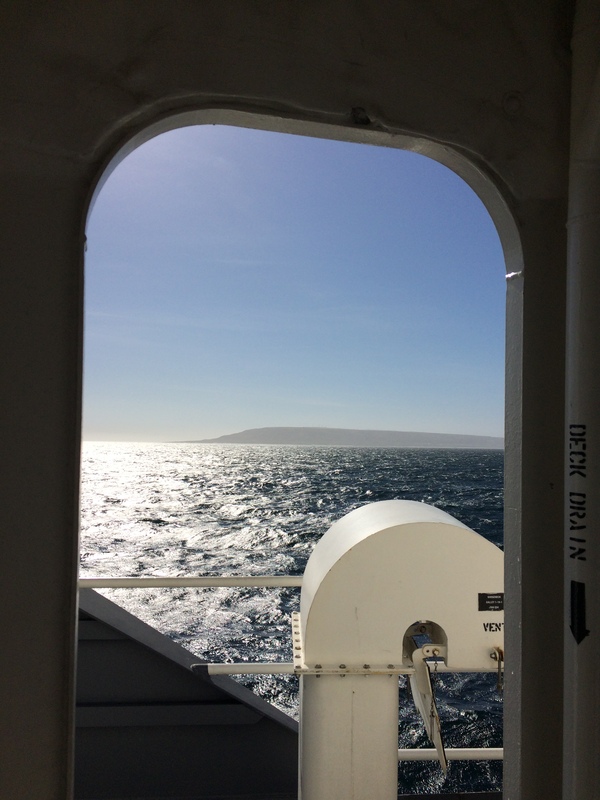 Figure 8: The mysterious island turns out to be Anacapa Island, which is part of the Channel Islands National Park. The waters surrounding the park are part of a national marine sanctuary. 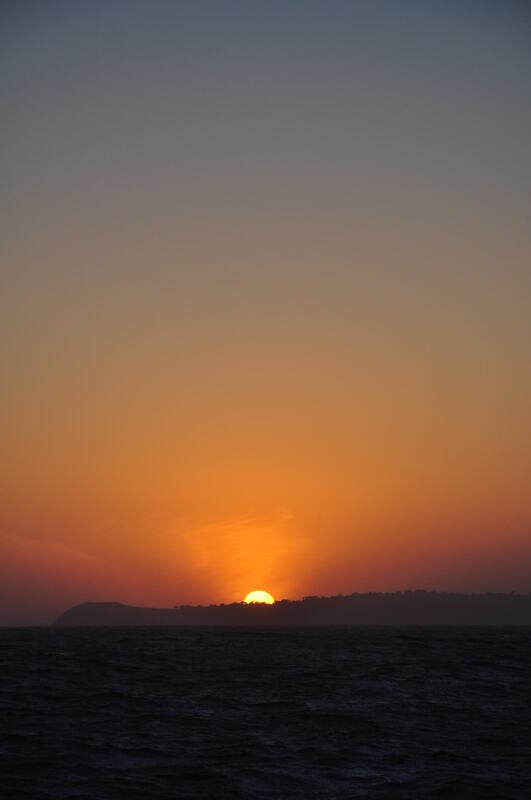 Figure 9: Sunrise over Santa Barbara. Time for me to make a call home! In the Dry Lab there is a computer with a map showing where we are currently located, a red track line showing where we have been and transect lines displaying where we will soon be (Figure 10). On our acoustic transects, we follow the parallel lines to mow the lawn and find the location of the CPS (coastal pelagic species) from their echoes. When we trawl, we break transect and go to places that showed promise in the acoustic backscatter. Figure 10: Without tracking our location on the computer I would feel totally lost! The blue lines are where we plan to go, and the red lines show where we’ve actually gone. Blue lines show where we plan to go, and the red lines show where we’ve actually gone. As I get ready for my night shift, I feel this anticipation to discover what species we are going to find! Every day brings a new catch of the day! Grey Smoothhound Shark (Mustelus californicus): This small coastal shark feeds on small invertebrates and fish. Needle Fish (Family Belonidae): This large needle fish is coastal piscivorous fish, meaning they specialize at eating other fish. They have a mouth full of tiny needle like teeth to prevent a slippery fish from getting away. Northern Anchovy (Engraulis mordax): This is one of our target species on this survey. Anchovy have the potential to form massive schools and have a tremendous impact of the ecology of the California Current Ecosystem. 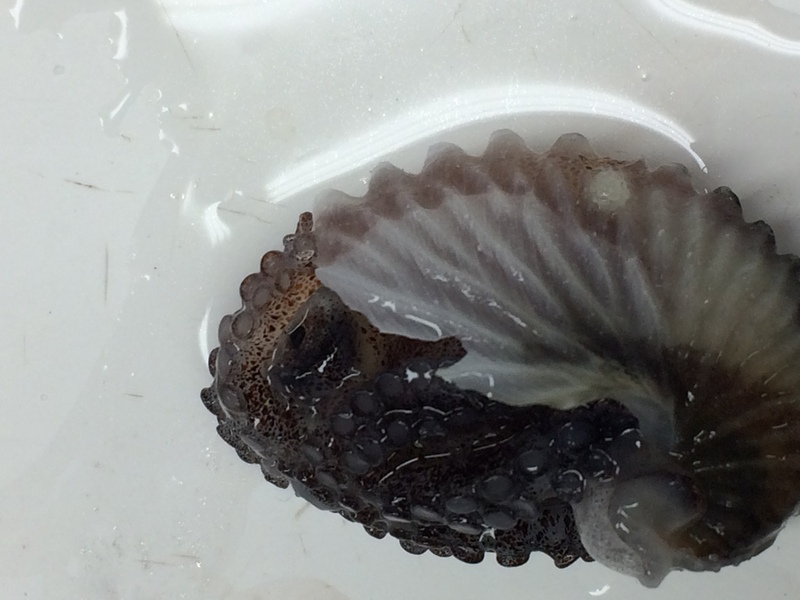 They feed on zooplankton, provide food for other fish, sea birds, and marine mammals. They are also an important fishery which have the potential to be over fished if not properly managed. Pacific Sardine (Sardinops sagax, top specimen) and Pacific Mackerel (Scomber japonicas, bottom two specimens): These two species are also part of the Coastal Pelagic Species community, which this survey are targeting. The sardine is another very important fish due to their ability to form tremendous schools, impacting plankton through feeding, providing food for larger predators, and they are a valuable fishery. Sardine populations have the ability to boom and crash, and the cause is still not fully understood. The Pacific mackerel is a species that has been populous at times of lower sardine and anchovy abundance. Jack Mackerel (Trachurus symmetricus) and Larval Rockfish (Sebastes sp. 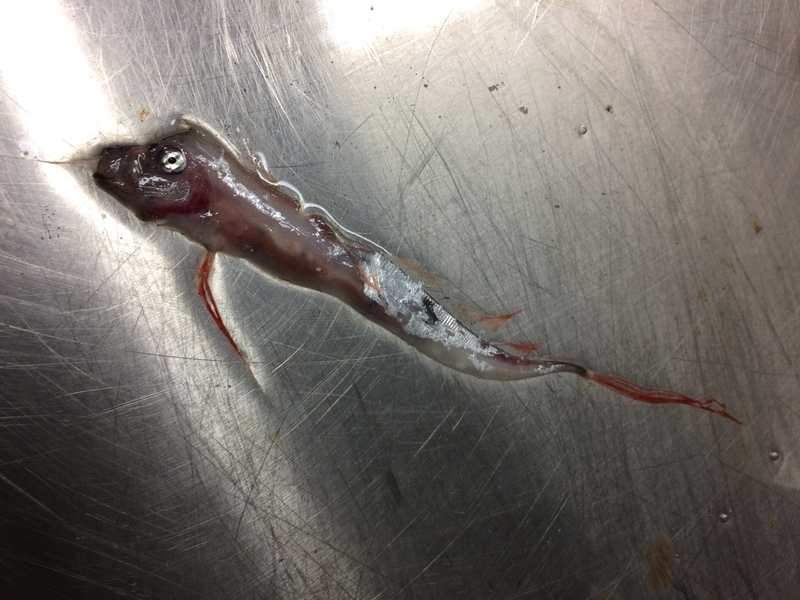 ): Jack Mackerel is another target species of the Coastal Pelagic Survey. ©2014 Oceanography, Volume 27, number 4, Zwolinski et al. Figure 2: An example echogram, showing the seabed and various sound scatterers in the water column. 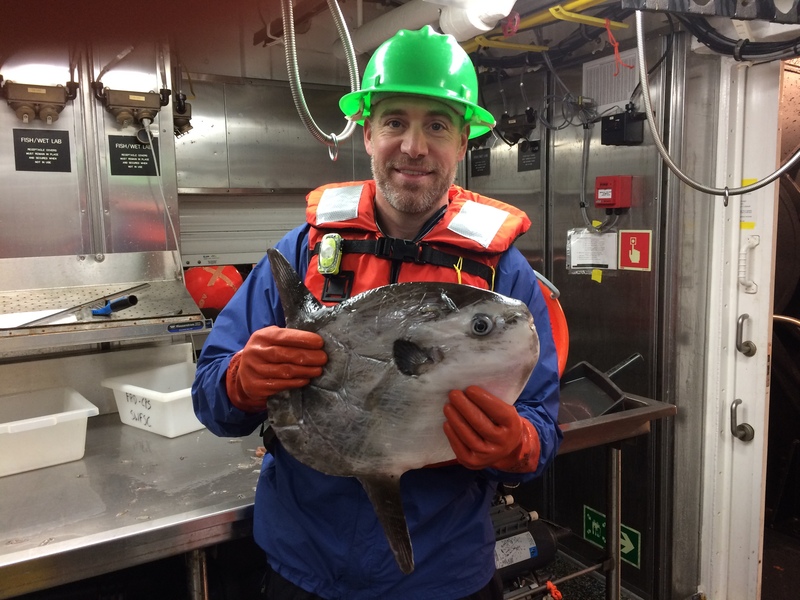 The Cruise Leader, Kevin Stierhoff, is a fisheries scientist who works for the Advanced Survey Technologies group at NOAA Southwest Fisheries Science Center (SWFSC) in San Diego, CA. Not only has he been effectively managing this complex science expedition, he has gone out of his way to make me feel welcome and a part of this scientific endeavor. I earned a B.S. in Biology, a Ph.D. in Marine Studies, and completed several postdoctoral research appointments prior to getting hired by NOAA. 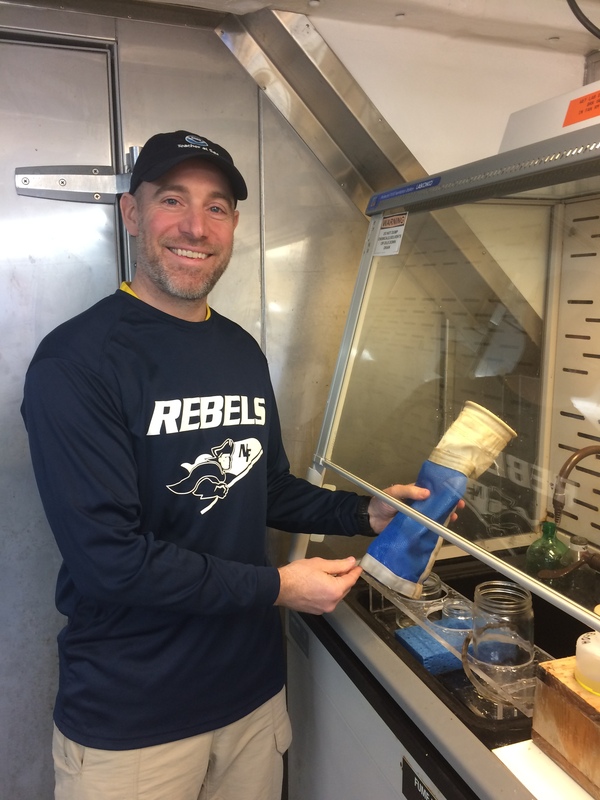 The work that my colleagues and I do at the SWFSC is very interdisciplinary, and the variety of educational and research experiences that I’ve had prepared me become a researcher at NOAA. I consider myself lucky to have a job with a variety of duties. Not only do I spend time in the office analyzing data, but I also get to spend time at sea conducting survey and collecting data. When I’m not using acoustics to study pelagic fishes that migrate between Canada and Mexico, I use remotely operated vehicles (ROVs, or undersea robots) to survey endangered abalone that live on rocky reefs in the deep sea. When I’m not at sea, I’m analyzing the data that we collected at sea to communicate the results of our work. Increasingly, a research career in marine biology requires a graduate degree to allow for maximal career advancement. If possible, take some time after undergrad to work in a job related to your career goals. This will allow you to focus your interests before choosing a graduate program, or perhaps discover that you don’t actually like that career path (better to find out sooner than later!) or that you don’t require a graduate degree to do the job that really interests you (which will save you lots of time and money). Most importantly, choose a job that you look forward to going to every day. It is dark out, but as I look down from high atop the ship through an open window from the bridge, the lights of Long Beach reflect on the placid expanse of ocean and I come to a great moment of reflection. One of the busiest ports in the world is just off in the distance and I am looking for marine mammals in this suburban wilderness. Beside the glow of humanity, nature continues on. I have been mostly helping with analyzing organisms that came up in the trawl at night, so my work schedule has moved to a 6 pm to 6 am. I am struck by how hardworking, dedicated, and driven all members of this expedition are. The crew, scientists, and NOAA Corps collaborate to continuously run surveys 24 hours a day, 7 days a week. I am enjoying working at night now even though it took me a few days to get use to all of the adjustments in my schedule. I particularly enjoy doing the marine mammal watch from the bridge. It gives you this aerial point of view of all the action the NOAA Corps expertly navigating the ship and coordinating operations, the deck crew masterfully deploying nets and equipment, and the scientists excitedly exploring the organisms we collect. 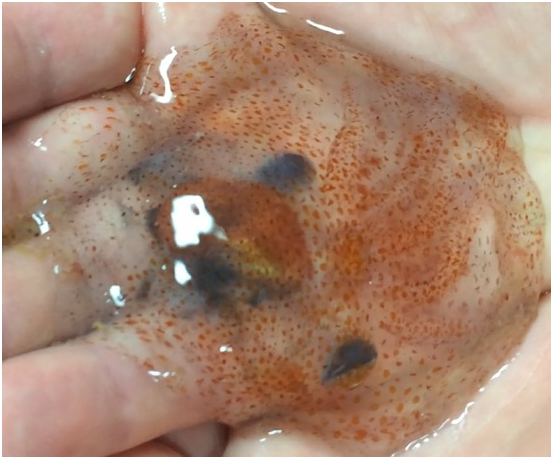 Haliphron atlanticus – This strange creature is a gelatinous octopus, whose body resembles a jellyfish, but when you look close, you see eyes looking at you! 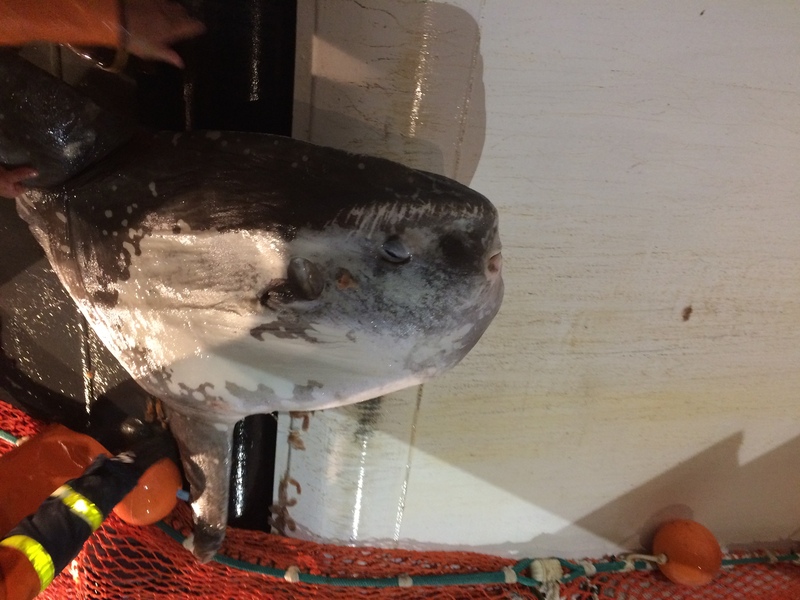 Ocean Sunfish (Mola mola) is the strangest fish I have ever seen! It is one of the heaviest bony fish, surprisingly from a diet high in jellyfish and salps. We caught a small and large sunfish. 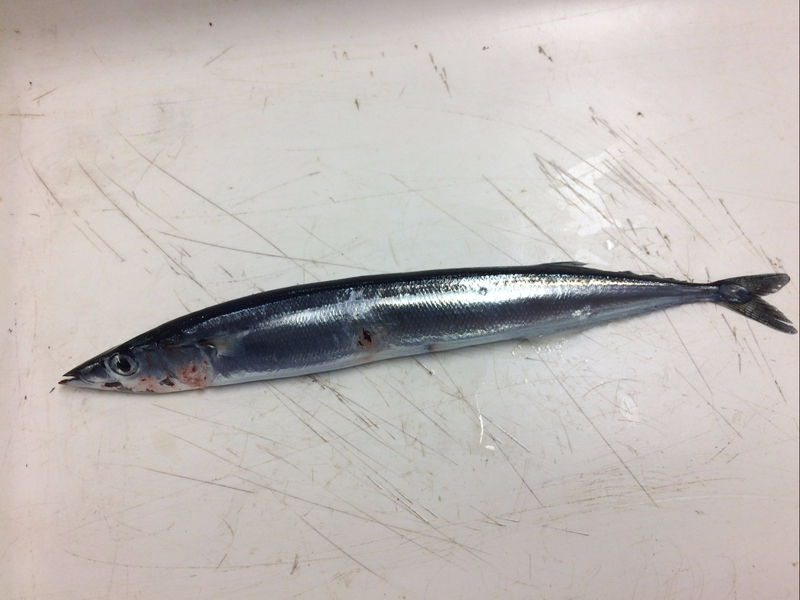 Pacific Saury (Cololabis saira): This fast looking fish hunts plankton at night near the surface. Curlfin Turbot (Pleuronichthys decurrens): This juvenile flatfish rises to the water surface at night to hunt zooplankton. Flatfish have an eye that migrates from one side of their body to the other as they develop. 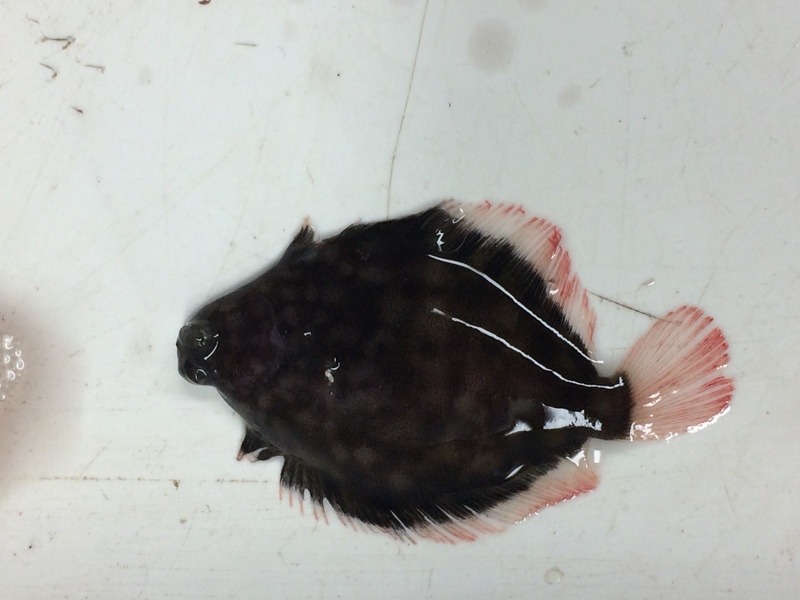 The Spring Coastal Pelagic Species Survey will be conducted in 2 legs between San Diego and Cape Mendocino, CA. 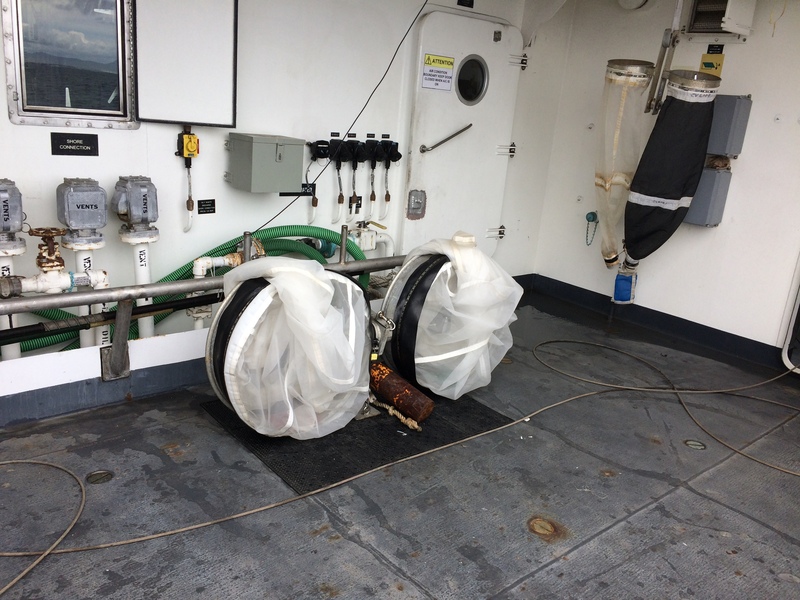 The ship will have a port call in San Francisco, CA between survey legs. The ship trawls for schooling coastal pelagic fish from sundown to sunrise. This is because, under the protection of darkness, the zooplankton come up toward the surface to feed on phytoplankton and the planktivorous fish, in turn, follow the zooplankton. Before the trawl net can be deployed, you have to go to the bridge, or the upper floor on the ship where all navigation and operations occur, to do a marine mammal watch for 30 minutes. A marine mammal watch is a lookout for dolphins or other marine mammals that might be in the vicinity of the ship to avoid catching them in the trawl. It is difficult to see any dolphins or sea lions in the inky blackness of the night ocean, but this is important to prevent incidental catch. My first time up to the bridge at night was a surprise. Walking up the lit stairs, you open the door to the bridge and the whole area is in darkness with just faint red lights so you can see. After a while your eyes adjust and you make you way to the port or starboard sides of the bridge to start the watch. After you determine that the coast is clear, it is time for the deck crew to start deploying the net. There is big overhead rigging with winches to help lift the net, ropes, chains, and buoys up to lower them down into the water. We drag the net behind the boat for 45 minutes and then haul it in, hopefully full of fish! When the fish are on the boat there is an elaborate process to gather information about the catch. The Wet Lab where the catch is sorted. 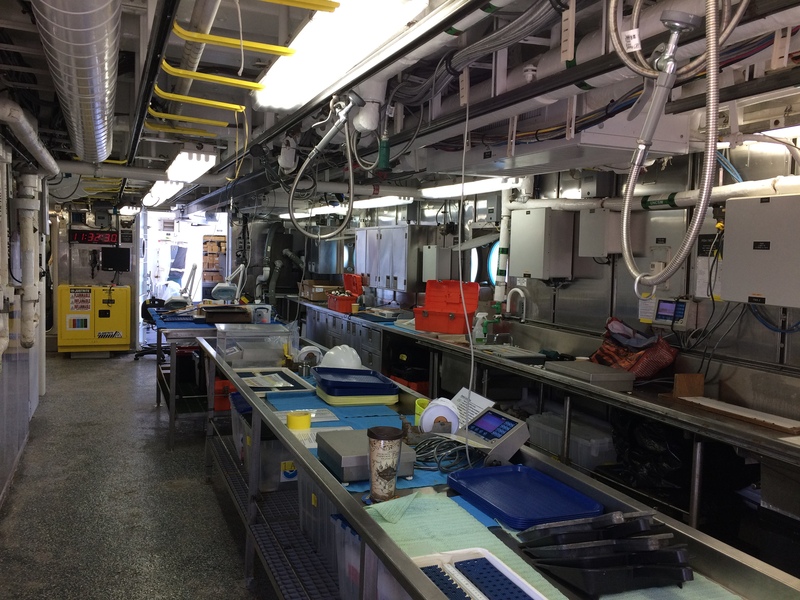 Today is the first day at sea and everyone is busy setting up their labs and calibrating their equipment. 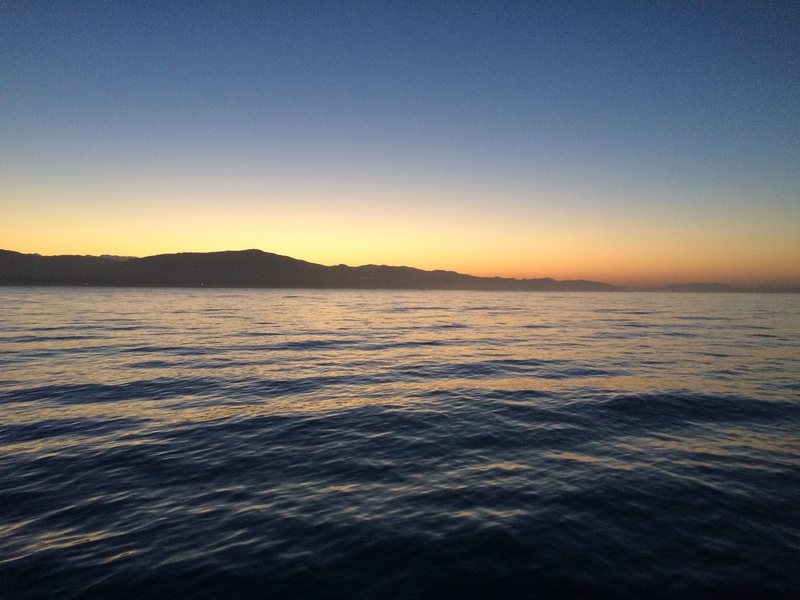 The goal of the research is to survey the distributions and abundances of the coastal pelagic fish stocks, their prey, and their biotic and abiotic environment in the California Current Ecosystem. The Reuben Lasker is a state of the art research vessel with many specialized research laboratories. I’m getting used to the 24 hour nature of the expedition. Everyone is assigned a 12 hour shift and I’m working 12 pm to 12 am. During the day I am currently observing the methods and trying to assist where I can. At night there are multiple trawls. 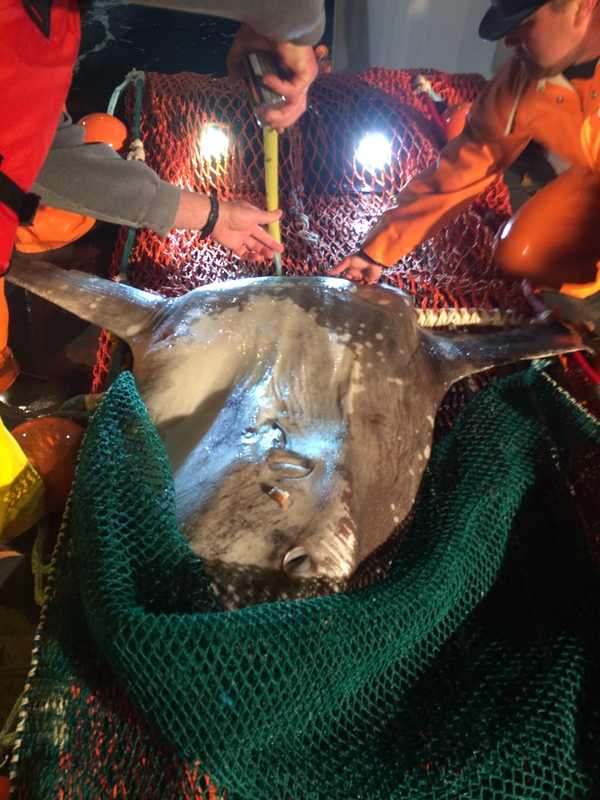 2 to 5 trawl are planned each night. 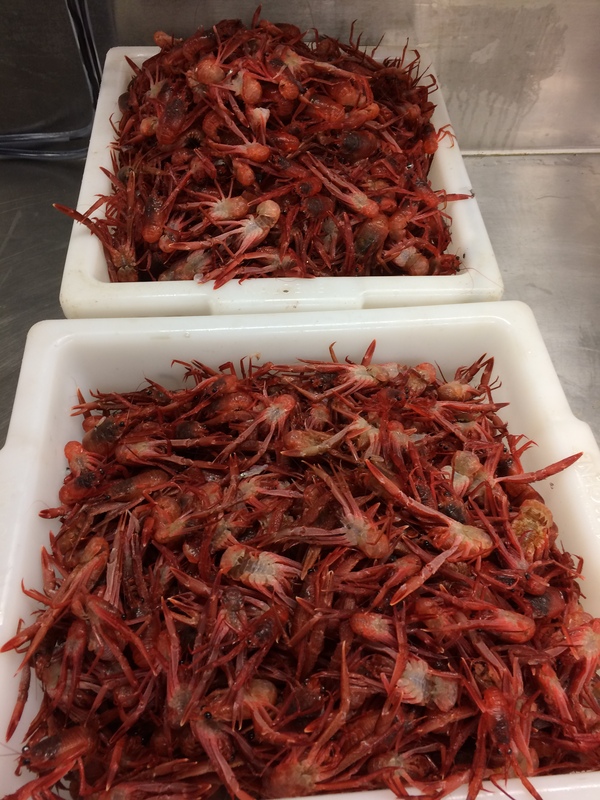 We caught a variety of different organisms, which are weighted, measured for length, and some saved for further studies such as genetic analysis. Today I woke up to rough seas with waves about 8 feet, which made it very difficult to get moving! As I moved around the ship everyone smiled because we know how each other are feeling. The seas calmed later in the day and everyone felt much better. 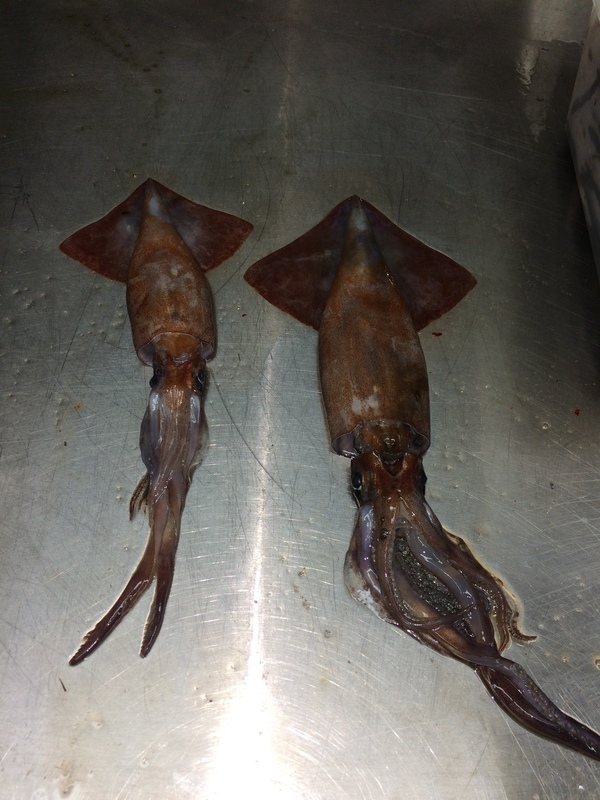 Looking forward to doing our trawl tonight! The King of the Salmon got their name from the Makah people who believed the fish lead salmon to their spawning rivers. The Argonaut looks like a nautilus, but they are really an octopus in which the female creates an egg case that wraps around the body. Current weather at home in Wingdale, New York is 39F and we just had 3 snow days in a week after 24 inches of snow. I will be joining the team aboard the Reuben Lasker to do the Spring Coastal Pelagic Species Survey. 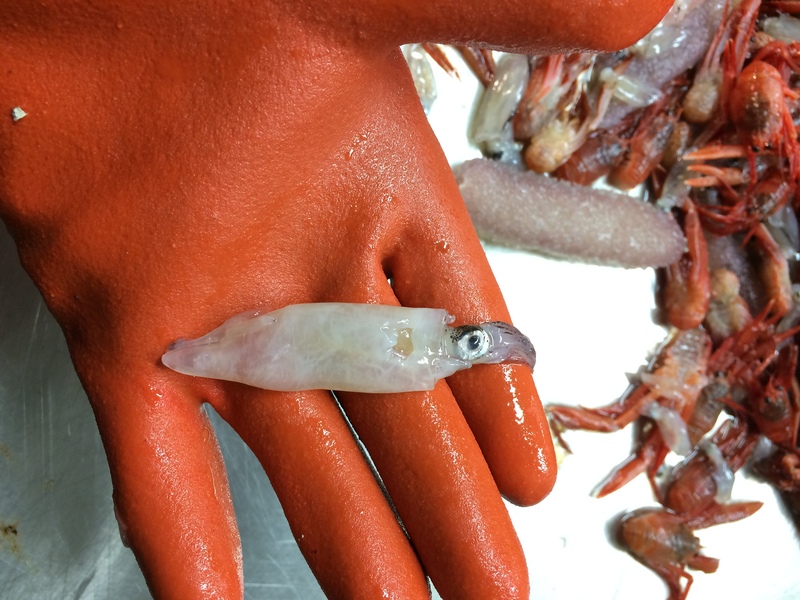 The goal of the survey is to determine the distributions and abundances of the planktivorous (plankton eating) fish such as Pacific sardine (Sardinops sagax), Northern anchovy (Engraulis mordax), jack mackerel (Trachurus symmetricus), and the Pacific mackerel (Scomber japonicus) in the California Current between San Diego and Cape Mendocino, California. This will be achieved using multi-frequency acoustic backscatter (sonar), sampling the fish with trawls, sampling spawned fish eggs in the water column, aerial surveys using UAS (unmanned aircraft system), sampling plankton, and measuring the abiotic environment such as temperature, salinity, oxygen levels. February 1st I walked into work, opened up my email and saw a message from NOAA. I opened the message and saw “On behalf of the National Oceanic and Atmospheric Administration’s Teacher at Sea Selection Committee, we are pleased to inform you that you were selected to participate in NOAA’s Teacher at Sea (TAS) Program – 2017 Field Season!” I couldn’t believe what an opportunity to learn from scientists and to enrich the classroom experience for my students! I teach AP Environmental Science at New Fairfield High School, in Connecticut, Biology at Western Connecticut State University, and teach field research and study the community structure of fish in Candlewood Lake, CT with Project CLEAR supported by the Candlewood Lake Authority and EdAdvance. A couple of weeks after I got my acceptance message and medical clearance, I got a research cruise placement on the Reuben Lasker out of San Diego, California! With three weeks to prepare, I did everything I could to cover my bases at home, school and prepare for the experience of a lifetime. I don’t think I have the words right now to express the gratitude I feel toward NOAA to have a program that allows a teacher to embed within their scientific community for a moment to experience what happens on those ships and bring my students behind the scenes of world class science. I look forward to going to San Diego soon and meeting everyone from NOAA that I have been corresponding with!